When you walk into a Walt Disney World resort hotel, one of the first things you’ll see after you take in the theme, is an array of desks. Though it may look like they’re all the same, each has its own purpose, with only minimal overlap. Heading to the right desk for your needs can save you a bit of time, particularly if there are lines at any of them. 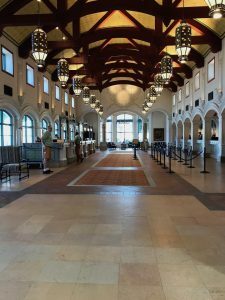 Coronado Springs lobby, with different desk on each side. If you have not completed online check-in prior to your arrival, this is will be your first stop at the hotel. 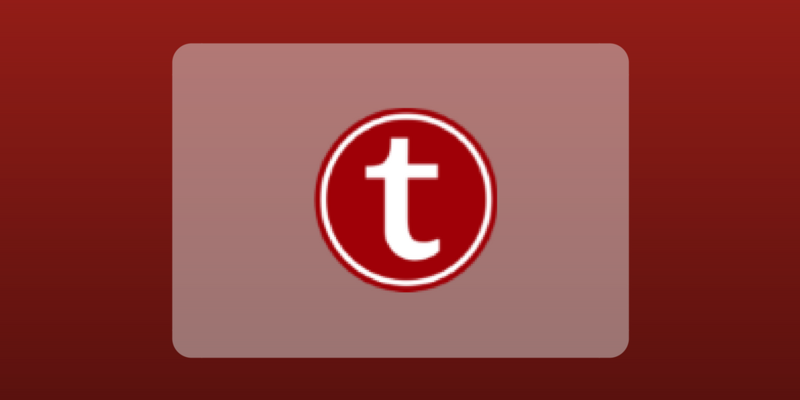 The check-in desk is where you’ll complete some rudimentary paperwork, like verifying your address and putting a credit card or other payment form on file. If you have not received your MagicBands in advance, you’ll get those here. And, most importantly, the check-in desk is where you’ll get your room assignment. If you have completed online check-in, you may be able to bypass the check-in desk, and the in-person check-in process entirely. During online check-in, you can input payment information and request email or text notification of your room number. If you have a MagicBand and a room number notification, then you’re all set and may be able to avoid the hotel lobby entirely. I’ve had a few trips to WDW where I never set foot in the main building of my hotel. However, if you’re someone who has very particular requirements about your room location, you may want to stop by the hotel check-in desk even if you’ve completed the online check-in process. (And even if you’ve used the TouringPlans Room Request tool.) At the check-in desk you can verify your room location and make any necessary modifications before hauling your stuff to accommodations that might not suit your needs. Bell Services at the Contemporary has in indoor desk, as well as an outdoor stand. Also note that if you’ve left payment on file and have no problems with your bill, there’s no need to physically stop by the front desk to check out. Take your Magic Band home with you and use it to decorate your cat. You can check your hotel bill at any time on the My Disney Experience app and they will leave a paper printout of your charges at your room just prior to your check-out. 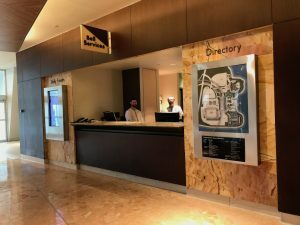 One particularly nice feature of Walt Disney World is that the cast members at the hotel lobby concierge desks are generally not expecting to be tipped, unlike the concierge staff at other hotels. You can ask them as many questions as you want without fear that you’re racking up some giant unspoken debt. Different lobby desks are next to each other at the Wilderness Lodge. Also, be aware that the lobby concierge desk is available for any guest. There are special dedicated concierge cast members that work in the Club Level areas of the deluxe hotels. These folks provide more personalized service than their colleagues in the lobby, and may be tipped for their service. The bell services folks are the ones who can help you carry your bags to/from your room to the lobby upon your arrival or departure. If you need help getting to/from your room, they can help with that as well. For example, if you’ve arrived at Saratoga Springs via Magical Express and have several suitcases with you and it’s dark and it’s raining (or you’re just tired, whatever), Bell Services will take you and your bags on a fun giant golf cart ride to your building and help you tote your luggage up to your room. These folks will expect to be tipped to their service. If you don’t want to tip, you should probably head to your room on your own. The DVC sales desk can’t help with anything related to your room, but they’re a decent resource if you just need quick directions. Bell Services can also store luggage for you on arrival or departure day. For example, if you arrive at WDW at 10:00 a.m. but your room won’t be ready until 3:00 p.m., there’s no need to wait around all day, watching your suitcases. Give them to Bell Services to hold, while you head off to play in the parks. Similarly, Bell Services will hold luggage for you on check-out if you’re not heading home until the afternoon or evening. Bell services can also call a cab for you, or offer driving directions to other Disney locations or other area attractions. If you’re at a Deluxe resort and are using the valet parking service, the valet service will either be at the bell desk, or nearby. You can also speak to Bell Services if you’ve had something bulky delivered to the hotel. This would include things such as mobility devices, strollers, or groceries. Smaller deliveries such as mail or a prescription will more likely be available via the concierge desk. Many, but not all, of the Disney resort hotels have a Disney Vacation Club sales desk. These folks are there to sell you stuff; they can’t help you with anything related to the mechanics of your current hotel stay. However, they are generally quite friendly, and often a bit bored. If everyone else looks busy and you just need a quick “Where’s the bathroom?” or “How do I get to the bus stop?” question answered, then they’re usually happy to help. Your hotel may have a mini business center in the lobby. The DVC sales at the Contemporary is on the second floor, near the entrance to Chef Mickey’s. I’ve never seen the sales rep there talking to prospective DVC buyers, but I have seen them direct hundreds of folks to the monorail entrance. The resort airline check-in counter is typically just outside the resort entrance rather than in the lobby proper. Think of RAC as you would the curbside check-in desk at an airport. This is where you can drop your luggage on departure day and have it magically arrive at the baggage carousel of your home airport. See our Magical Express FAQ post for more details. What have been your experiences in the hotel lobby? Do you use the check-in desk? What has the concierge helped you with? Let us know in the comments below. 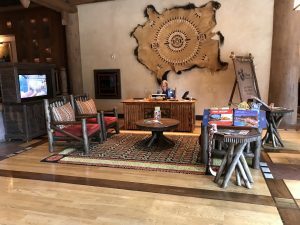 Anyone know where the desks are at Carribean Beach Resort and Wilderness Lodge? 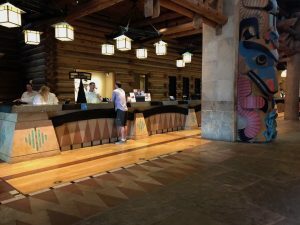 At the Wilderness Lodge, the check-in and concierge desks are next to each other, on the right as you enter the lobby. The Caribbean Beach resort desk locations are somewhat fluid lately. They’ve moved during the major resort construction that’s been ongoing for the past two years. Your best bet there is to ask the guard at the resort entrance gate to get information that’s absolutely current. If you lose your MAgic Band during your trip (may or may not have happened to me 😉 ), the Check-In desk is where you deactivate the old one and get a new one. They have all the colors! It just won’t be personalized like the ones you ordered online. I lost my Purple MB at Coronado and the desk said they could only give me grey as a replacement. I was so hoping someone would turn it in!! Can I purchase special events tickets at the concierge desk? Looking to pick up MNSSHP tickets for arrival day and I don’t want to purchase ahead in case we are delayed. 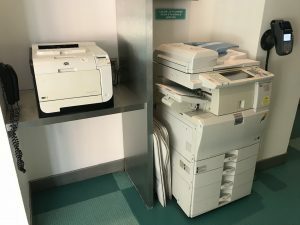 Concierge desks at WALT DISNEY WORLD SWAN & DOLPHIN RESORTS ? Good question. Those are not Disney hotels, so yes, I would offer a tip.